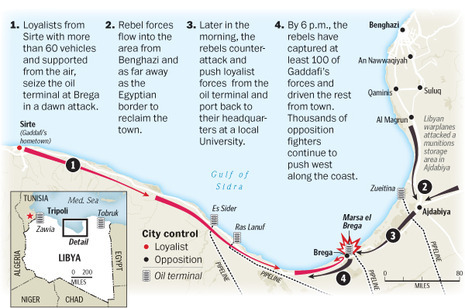 Libyan air forces rained at least three airstrikes down on Brega today, a day after rebel forces drove Gadhafi loyalists out of the major oil town. There was also a strike just outside of Ajdabiya, about 40 miles away, the Washington Post reports. But there was no fresh ground fighting, and some rebels, emboldened by their apparent victory, say they intend to press west into Tripoli. "We will continue to send a clear message: the violence must stop," Obama said in opening remarks at a White House news conference with visiting Mexican President Felipe Calderon. 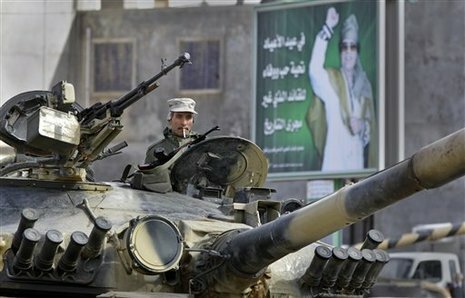 "Moammar Gaddafi has lost legitimacy to lead, and he must leave. . . . The aspirations of the Libyan people for freedom, democracy and dignity must be met." Obama previously had called for Gaddafi's departure from power in a written statement.